This group contains some 1500 species which are located throughout the sub-tropical and tropical zones of Africa and the Americas. Next to the livebearers, they are the most popular fish kept in the community tank set ups. Their popularity is due to their bright colors, pleasant temperament and schooling behavior. Tetra tanks are always lively tanks. To view statistics on many individual Characins, just click on any picture. Most Characines have an additional fin between the Dorsal and the Caudal fins, called the Adipose fin. This fin is not supported by any rays. The bodies of the Characins are covered in scales. Even though most Tetras live in open water they still need some protected areas in the tank to be happy. These can be provided through patches of dense vegetation and placement of Drift-wood and bog branches. The lighting and substrate should not be overly bright as you do not want to wash out their brilliant colors. Some floating plants are also helpful. For most Tetras, slightly acidic water with a pH of around 6.5 and soft to medium hard water is best. 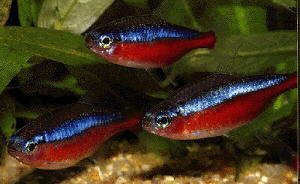 Most Tetras are schooling fish and will not show their normal behavior patterns or colors unless the are kept in groups. You should keep a minimum of at least six individuals of the same species, with more being better. In many species, the male will claim a small territory which they will defend against other males, but this just leads to the liveliness of the tank. Characins can easily be kept with dwarf Cichlids, Catfish, and other peaceful species. Larger fish species that lay claim to territories, especially the Cichlids, should be avoided as they dominate the tank and would not mind a Tetra snack. Cichlids during brood care cannot even tolerate themselves. 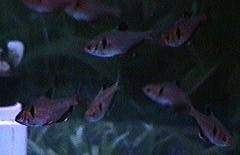 An ideal community for the Characins is made up of Tetras, Rasboras and some catfish from the Corydoras family. Most Characins are not breed easily. The Aquarist must be willing to spend a lot of time and have patience to breed them. 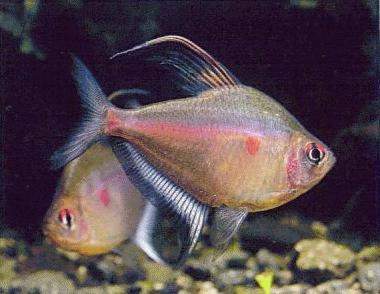 The Tetras do not engage in any type of brood care, but simply deposit their eggs on plants or scatter them around the tank. Water conditions must be very Acidic and would not be suitable for a community set-up. A separate breeding tank must be set up, with the proper water conditions and temperature. Once the eggs are laid the parents must be removed or they will eat the eggs. The finest of food must be available, and in some species baby Brine shrimp is even too large for the first couple of days. Although difficult to do, breeding is not impossible and can be one of the best experiences in your hobby.